Scams have been a fact of life from the beginning of time. Like it or not, there are many bad people out there who have absolutely no problem with taking advantage of you — for example, some estimates set the number of psychopaths in the general population at 1%. That means one out of every hundred people you interact with is probably willing to rob you blind in whatever way they can, especially if they can get away with it. Some people have suggested that cryptocurrency, with its promises of anonymity and decentralization, attracts these sorts of people in droves. It’s true, there have been a lot of crypto scams — sometimes entire coins could be considered scams! Look no further than BitConnect or The Billion Coin (TBC) if you want examples of things that pretty much everyone would characterize as scams or Ponzi schemes. The unfortunate reality is that you don’t have to be stupid to fall for a scam — sometimes you don’t even have to be ignorant. If your guard isn’t up, it’s very easy to start believing in something that seems “too good to be true.” The worst thing about scams in cryptocurrency, other than that bad people are profiting from bad behavior, is that the crypto market itself suffers a reputation hit from it. Because of shady jackasses like Carlos Matos, some non-technical people outside of the crypto-sphere often get the impression that all cryptocurrencies are just scams with no value or potential. Is this really the guy you want to take investment advice from? As Bitcoin roars back to life after the recent downturn, one thing remains true: some people are always trying to take your money in unethical ways. Many scams, Ponzi schemes, etc. seem extremely obvious at a glance. Some examples of these are the fake Twitter accounts claiming to be Elon Musk, or a representative of Binance, or some other famous/trustworthy source. These accounts will post tweets claiming that they’re running a crypto giveaway and, if you send them some Ether, you’ll get more Ether back. In order to inspire confidence, many sockpuppet accounts will reply claiming that they participated and received some Ether. As you can imagine, the above probably isn’t going to work on a technical person. However, if you’re new to crypto, you might not understand how ridiculous the idea is. You might even get blinded by the exciting offer of “free money,” and fail to really think critically about what it is you’re participating in. The bottom line is that if it seems too good to be true, it probably is. Nobody is going to offer you more money in exchange for a smaller amount of money — the world just doesn’t work that way. What about less obvious scams, though? It’s a known fact that ICOs exist which are, in essence, just a sort of revenue generation scheme with no actual plans to follow through on anything. Take a look at this article about Confido for example — around $375,000 was raised in an ICO which was basically just an exit scam. One should always be wary of investing in coins that seem like they might be a scam — and that brings me to the real focus of this article: Waltonchain. 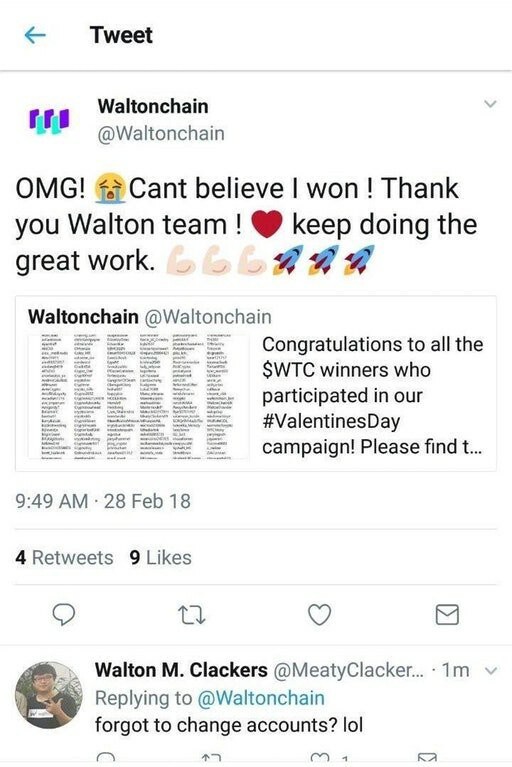 “Fake” Waltonchain Promotion — Proof Walton is a Scam? The “scandal,” if you want to call it that, had a pretty immediate real-world impact: the Walton token’s price took something like a 20% hit. Ouch! There are really only two possibilities: either their explanation is true, or this was indeed a total or partial counterfeit giveaway. There would be a decently strong financial motivation for them to not run the giveaway for real, at least not in total; 564.96 WTC was worth over twelve thousand dollars on Feb. 28th. That’s a pretty massive chunk of change to be throwing out on one twitter marketing campaign — even if just half of the prize winners were nonexistent, that’s six thousand bucks saved. More troubling, I’ve seen reports that many people were banned from the subreddit for discussing the event. The point this guy makes is an interesting one: that “Thank you Walton team ! keep doing the great work” sounds like someone specifically trying not to look like a member of the team. Worse still, the video they provided doesn’t seem to really be great proof of anything. The broader, more important issue is whether or not this means Waltonchain itself is a scam. For me, that’s a matter of opinion. Is it unethical to run a marketing campaign like this and not actually hand out the rewards? Without question. But what does this mean for the Waltonchain development team and the token? Now, to preface this, I’m not saying that the campaign was a fake — only that they had financial incentive to fake it and that the overall response and censorship was pretty unnerving. This whole thing reflects fairly poorly on Waltonchain even if you take the team’s response as the truth — and it very well might be the truth! With all that said, even if the giveaway was fraudulent, I do not think this means by default that Waltonchain is some sort of scam, vaporware, etc. Personally, I am exercising caution — I don’t think I’ll be going all-in on WTC anytime soon. In spite of everything, I still think the Walton project is pretty interesting, and I’m curious to see if it rises like a phoenix out of these ashes. As of this writing it’s still ranked 42 by coin market capitalization after all… it can’t be as bad as BitConnect, right? Know of any other egregious scams in the crypto world? Want me to write about them? Let me know! I love to hear feedback from people and get ideas on what cryptocurrency topics I should research. You never know, I might even write an article about your suggestion!